The bachelor thesis entitled “Proveniência de Paragnaisses da Unidade Búzios” was presented at the Geoscience Institute of the Universidade Federal de Minas Gerais (UFMG) by Luiza Carneiro de Rezende, whose research impacts into the comprehension of the evolutive process of Gondwana. 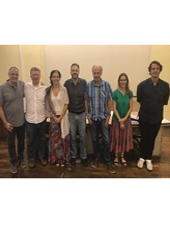 She had Dr. Antônio Carlos Pedrosa Soares (UFMG) as advisor and Dr. Renata Schmitt (UFRJ) as co-advisor, while the examining board was composed by Dr. Tiago Amâncio Novo (UFMG) and Dr. Jorge Geraldo Roncato Júnior (UFMG). The MSc. thesis in Geology about the Alto Tapajós Basin, Brazil, and entitled “Arcabouço Estrutural e evolução Tectônica da Bacia do Alto Tapajós, Brasil Central” was presented at the Universidade Federal do Rio de Janeiro (UFRJ) by the geologist André Toczeck, whose research impacts into the comprehension of the evolutive process of Gondwana.. The MSc. 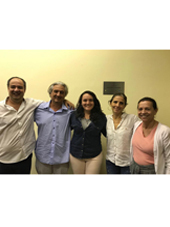 Student was advised by Dr. Renata Schmitt (UFRJ) and the examining board was composed by Dr. Rudolph Allard Johannes Trouw (UFRJ), Dr. Edison José Milani (Petrobras) e Dr. Natasha Stanton (UERJ). The MSc. thesis in Geology about Ikalamavony, Madagascar, entitled “Evolução Tectônica das Unidades Litoestratigráficas Para-derivadas Neoproterozoicas de Alto Grau na Região de Ikalamavony, Madagascar Central (África)” was presented at the Universidade Federal do Rio de Janeiro (UFRJ) by the geologist Raisa Lopes Costa, researcher of the Gondwana Map Project. The MSc. Student was advised by Dr. Renata Schmitt (UFRJ) and co-advised by Dr. Alan Collins (University of Adelaide). The examining board was composed by Dr. Ciro Alexandre Ávila (UFRJ), Dr. Mauro César Geraldes (UERJ) and Dr. Silvia Regina de Medeiros (UFRJ). 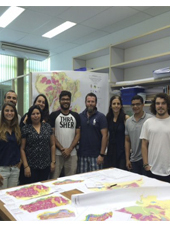 The bachelor thesis entitled “Correlação de Domínios Geológicos para a Reconstrução da Porção Central do Gondwana” was presented at the Geology Department of the Universidade Federal do Rio de Janeiro (UFRJ) by Igor Vasconcelos Gomes, researcher of the Gondwana Map Project. 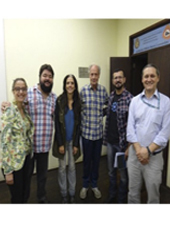 He had Dr. Renata Schmitt (UFRJ) as advisor and an examining board composed by Dr. Julio Cezar Mendes (UFRJ) and Dr. José Carlos Seoane Sícoli (UFRJ). The MSc. thesis in Geology about the Parnaíba Basin, Brazil, entitled “Evolução Tectonossedimentar do Grupo Serra Grande na Borda Nordeste da Bacia do Parnaíba e Correlações com o Gondwana Oeste” was presented at the Universidade Federal do Rio de Janeiro (UFRJ) by the geologist André Pereira de Assis, researcher of the Gondwana Map Project. The MSc. Student was advised by Dr. Renata Schmitt (UFRJ), Prof. Silvia Regina de Medeiros (UFRJ) and Prof. Bastien Linol (Nelson Mandela University). The examining board was composed by Dr. Leonardo Borghi da Fonseca (UFRJ), Dr. Claiton M. dos Santos Scherer (UFRGS) and Dr. Renato Cabral Ramos (Museu Nacional). Prof. Hartwig E. Frimmel (University of Wuerzburg – Germany) spent a few days at the Gondwana Digital Center of Geoprocessing (GDCG), Rio de Janeiro. Aiming to debate the information included on the geological maps of Africa and South America, he contributed with a meticulous review of the geology of the mobile belts which are related to Pan-African/Brasiliano events. The MSc. 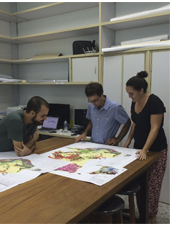 Thesis in Geology of the Post-Graduation Program of the Federal University o Rio de Janeiro (UFRJ) entitled “Subdivisão da porção continental da Placa Sul-Americana: um modelo baseado em geologia” was defended by Gondwana Project geologist Pâmela Richetti. The MSc. Student was advised by Dr. Renata Schmitt (UFRJ) and Dr. Colin Reeves. The examining board was composed by Dr. Cláudio Limeira Mello (UFRJ), Dr. João Marinho de Morais Neto (Petrobrás) and Dr. Mário Neto Cavalcante de Araújo (Petrobrás). The doctoral thesis on Geology entitled “Neoproterozoic Successions of the Damara Supegroup in northwest Namibia: Stratigraphy, Paleoenvironments and Provenance” was defended, with honor, in the Department of Geology of the Federal University of Rio de Janeiro (UFRJ) by Débora Barros Nascimento, Researcher of the Gondwana Project. Prof. Renata Schmitt (UFRJ) and Prof. André Ribeiro (UFRJ) were the advisors. 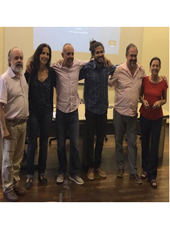 The examining board was composed by professors José Carlos Sícoli Seoane (UFRJ), Renato Rodriguez Cabral Ramos (National Museum – UFRJ), Monica da Costa Pereira Lavalle Heilbron (UERJ), Adriano Roessler Viana (PETROBRAS) and Elton Luiz Dantas (UnB). More information about this work, it is available on our site, in the tab Field Works. 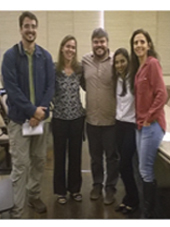 The bachelor thesis entitled “RECONSTRUCTION OF THE CONJUGATED MARGINS BRAZIL-AFRICA (CAMPOS-KWANZA SEGMENT) DURING THE 130-111 Ma INTERVAL – FROM GEOLOGICAL AND MAGNETOMETRY DATA” was defended at the Geology Department – UFRJ by Melissa Meirelles Pereira, researcher from the Gondwana project. Prof. Renata Schmitt (UFRJ) and Prof. Natasha Stanton (State University of Rio de Janeiro – UERJ). The committee was also composed by Prof Marco Antônio Braga (UFRJ) and the geologist Marco Antônio Thoaldo Romeiro (Petrobrás). 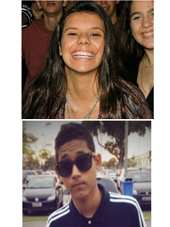 Our fellows PIBIC-EM Laura Correa Machareth and Luis Eduardo Ortega from the UFRJ College Application (Capes-UFRJ) will integrate the Gondwana team, from this month on. The integration of high school students to the project aims to strengthen the process of dissemination of information and scientific and basic technological knowledge, and also develop attitudes, skills and values necessary for scientific and technological education of the students. The MSc. thesis in Geology of the Post Graduation Program of UFRJ entitled “Análise estrutural e cronologia das estruturas de natureza rúptil do embasamento cristalino na margem continental do SE brasileiro relacionadas a zonas de transferência e acomodação do sin-rifte da Bacia de Campos-RJ.” was defended by the geologist from Petrobras Vitor Lamy Mesiano Savastano. The MSc. student was advised the Dr. Renata Schmitt (UFRJ) and Mario Neto Araújo, PhD (Petrobras). 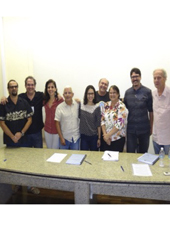 The examining board was composed by Rudolph Trouw, PhD (UFRJ), Dr. Marcos Fetter and Dr. Ana Paula Pelosi. 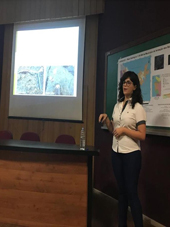 The bachelor thesis entitled “Geological characterization and U-Pb data interpretation of zircon grains from metasedimentary rocks of Central Madagascar” was defended at the Geology Department of Federal University of Rio de Janeiro (UFRJ) by Raisa Lopes Costa, researcher from the Gondwana Project. The student was supervised by Prof Renata Schmitt (UFRJ-Brazil) and Prof. Alan Collins (University of Adelaide-Australia). 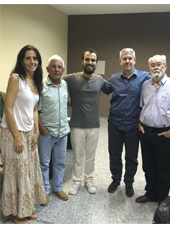 The committee was also composed by Prof. Alexis Rosa Nummer (UFRRJ) and Ciro Alexandre Ávila (Nacional Museum – UFRJ). More information about this project on our website, page Field Trips. Seeking the development of the Gondwana Memory Center, beginning this month, the project counts on the museologist Jessica Tarine. Her tasks include organizing, preserving and exhibiting the results of the project and its development. 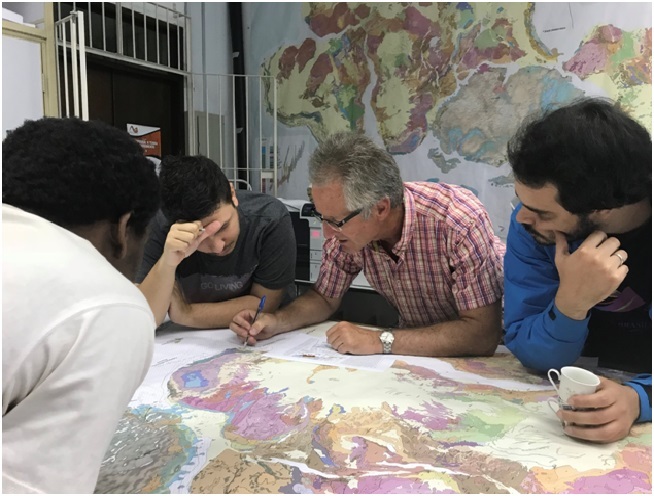 IGCP-628 project – Review of the Geological Map of Gondwana: Geology and tectonic evolution, recognizes and emphasizes the importance of multidisciplinary teams, including on its staff the scientific and technical characteristics to explore the collection’s potential, as much as possible. The bachelor thesis entitled “Geology of Lihuel Calel, La Pampa Province, Argentina” was defended at the Geology Department- UFRJ by Rafael de Araújo Fragoso, researcher from the Gondwana project. 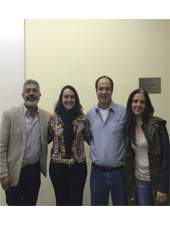 Prof. Victor Ramos (UBA – Argentina) and Prof. Renata Schmitt (UFRJ – Brazil) were the supervisors. The Committee was also composed by Prof. Carlos Augusto Sommer (UFRGS – Brazil) and Prof. André Ribeiro (UFRJ – Brazil). More information on our website, page Field Trips. Prof. Gideon Rosenbaum (University of Queensland – Australia) visited the Gondwana Lab, where he had stayed for two weeks. During this meeting Rosenbaum reviewed the geological map of Australia, eastern sector, regarding the Phanerozoic orogens. One of the major outcomes from this meeting is the outline of a project to study in detail the Gondwana margin during the Permian and Triassic periods, comparing sedimentary/magmatic and tectonic events from southern South America until Eastern Australia. He also gave a talk on Phanerozoic orogens of Eastern Australia. Prof. Chris Clark (Curtin University – Perth – Australia) stayed one week at the Gondwana Lab in Rio de Janeiro in order to discuss the issues related to metamorphic assemblages and units of the Gondwana Map. He revised also the western part of the Australia geological map. Prof. Clark gave a talk on the “Metamorphic evolution of southern India during Gondwana amalgamation events”. One of the outcomes was the outline of collaboration on a students exchanging program concerning the metamorphic evolution of Brasiliano belts, between Curtin University and UFRJ. Prof. Clark participated in a one-day field trip through the outcrops of Rio de Janeiro city, a Neoproterozoic terrane of the Ribeira Orogen.